ESPO printer from Matsuname does not appear to have complete IP configuration when it is set to DHCP. 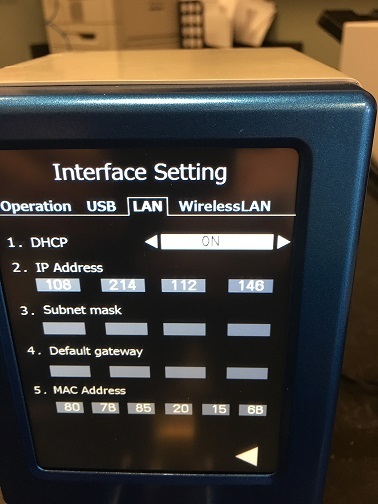 The display shows only IP address. Subnet mask and Default gateway are blank. The printer should receive 3 pieces of information from the DHCP server; IP address, Subnet Mask and Default gateway. Displaying a blank Subnet Mask and Default Gateway is normal for this printer. The printer received all 3 pieces of information. However, the display does not reflect the information it has.